Kinyo glaze, which varies in colour from green to red, owes its name to the Jun Kiln (pronounced kinyo in Japanese), one of the finest kilns in the northern Song China, where this type of glaze was often used. 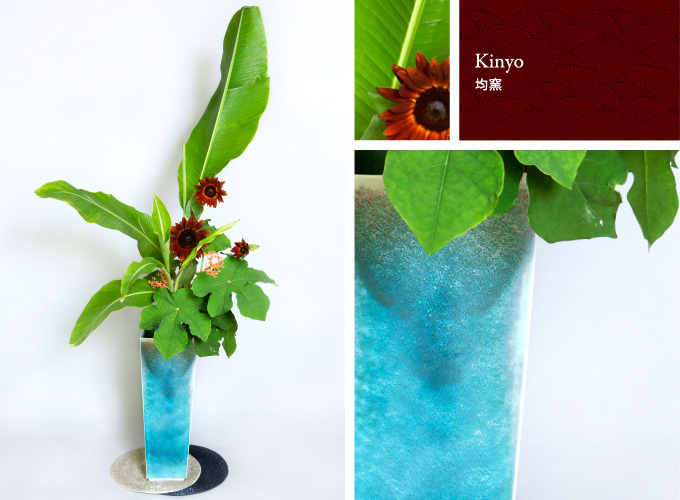 Typical kinyo glazes include moon-white geppaku kinyo, crimson-purple koushi kinyo, and blue or green ro kinyo. Shinemon II particularly enjoys the variation of red and purple colours on a sky-blue background. In China, kinyo ware has been valued since old times as ceramic ware for the nobility.